Moffat County High School basketball players head back onto the court after halftime against Lutheran. MCHS girls will leave Wednesday for the state tournament Thursday through Saturday. 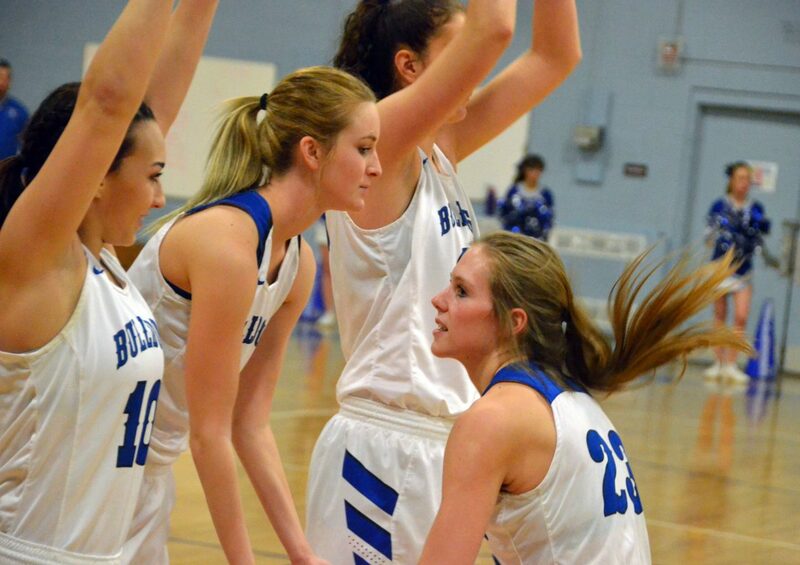 Moffat County High School's Jaci McDiffett exchanges high fives with teammates Quinn Pinnt, left, Kinlie Brennise and Brooke Gumber during pre-game warmups. 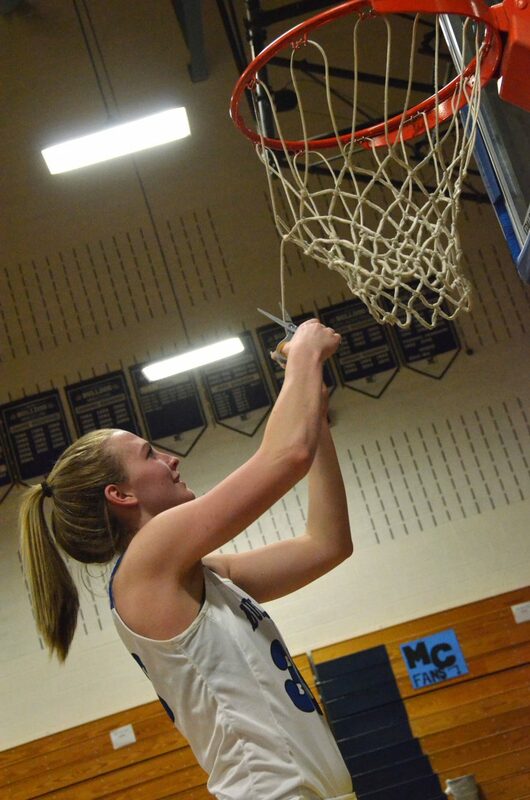 Moffat County High School's Jana Camilletti cuts loose a piece of the home net in the MCHS gym following a regional tournament win against Lutheran. Moffat County High School's Jana Camilletti leans in against Lutheran's Haley Shaklee to draw a foul. Moffat County High School girls basketball players are ready to take the court following pre-game warmups. Moffat County High School's Tiffany Hildebrandt lines up a free throw against Lutheran. Late foul shots by Hildebrandt and Jana Camilletti helped clinch the win against the Lions. 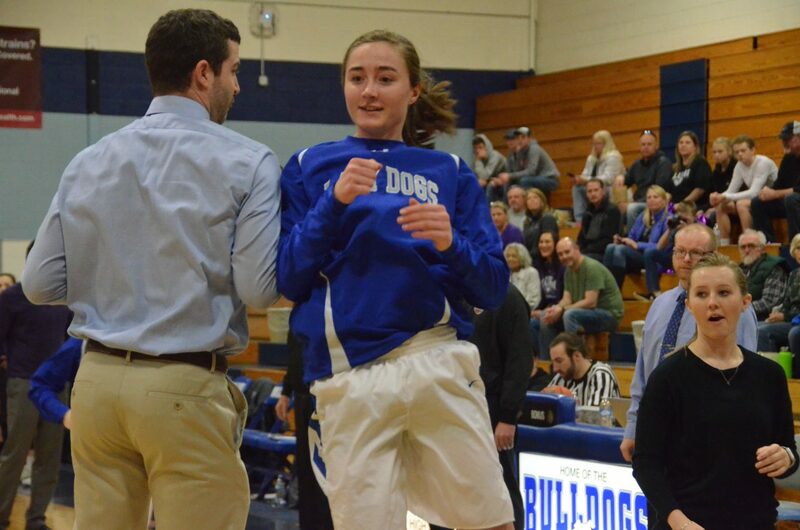 Moffat County High School's Josie Timmer bumps shoulders with assistant coach Joe Padon during pre-game warmups. Moffat County High School's Madie Weber and Lutheran's Lexi Wilmoth pursue a loose ball. 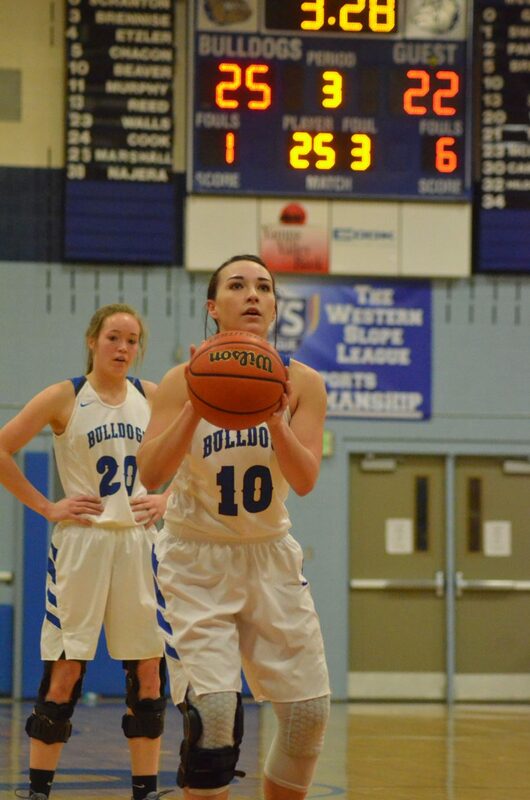 Moffat County High School's Quinn Pinnt readies for a free throw as Lady Bulldogs hold a small lead against Lutheran. 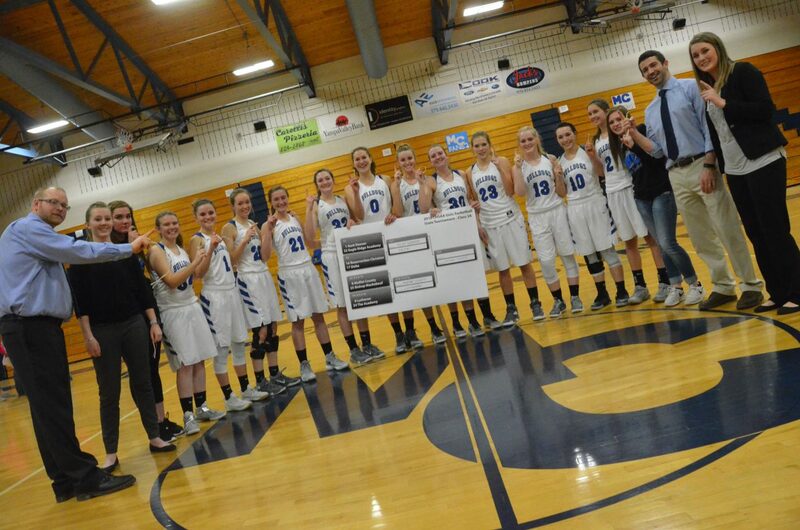 Moffat County High School varsity players proudly display the regional brackets of the 3A CHSAA State Championships. Eighth-seeded MCHS will face No. 1 Kent Denver in the Great 8. Moffat County High School assistant coach Joe Padon holds the ladder steady for Emaleigh Papierski to snip a piece of the net after a win against Lutheran. Moffat County High School girls basketball players huddle up and get their energy gathered during pre-game warmups. Moffat County High School players, coaches and managers display No. 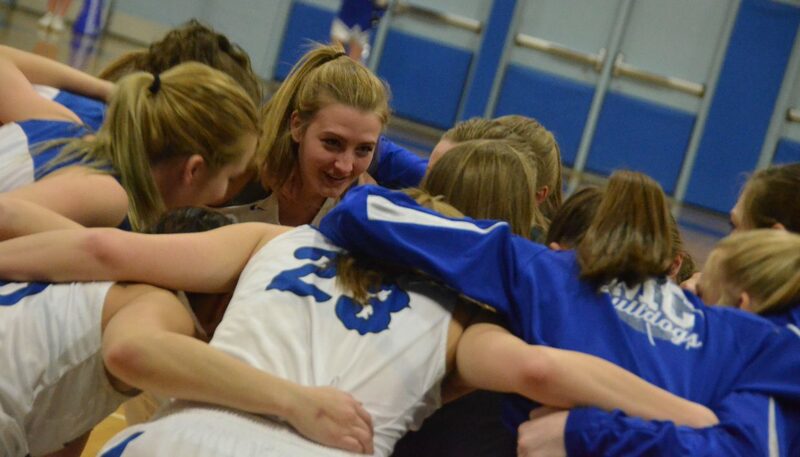 1 as well as portions of their home net following a 44-38 win against Lutheran in the Region 8 Tournament Saturday. MCHS advances to the Great 8 March 8 in Denver. 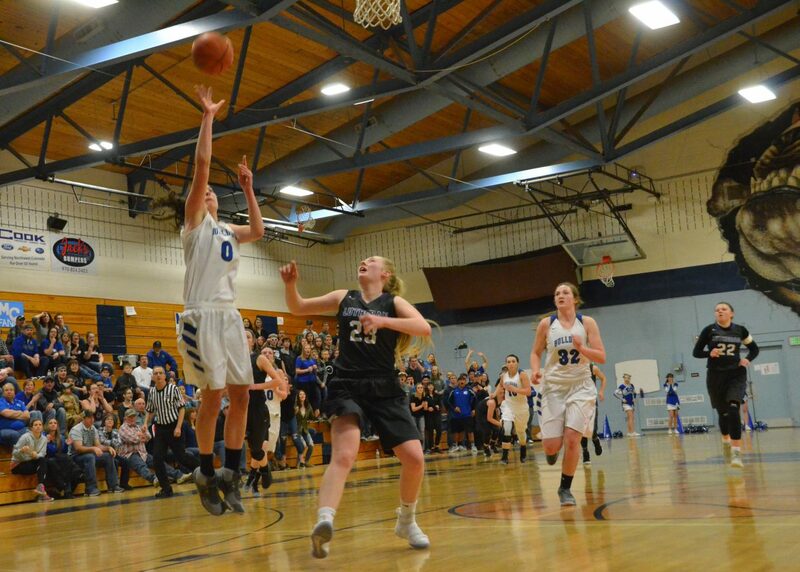 Moffat County High School's Brooke Gumber has a clean shot against Lutheran. Moffat County High School's Kinlie Brennise goes in for the layup against Lutheran. Third time’s the charm, folks. 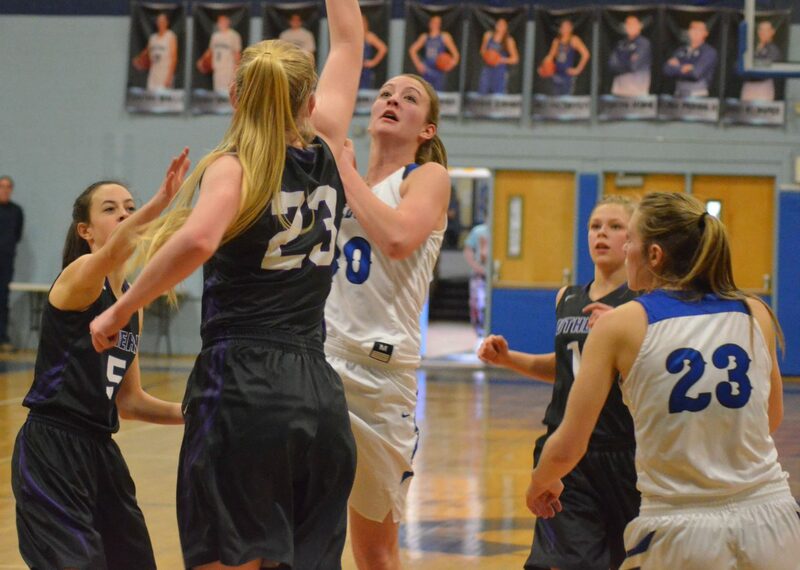 Moffat County High School girls basketball secured its place in the final rounds of the 3A CHSAA State Championships with a 44-38 victory against Lutheran in Saturday’s Sweet 16. This is the third time in four years the two teams have met in the playoffs, and the first time MCHS has defeated the Lady Lions. Despite the final score, it was looking like history would repeat itself. 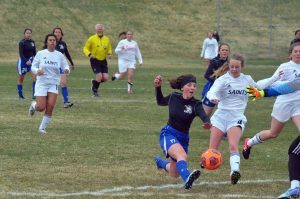 Lutheran’s past dominance against the Bulldogs included wins against the Moffat County crew in 2015 and 2016 during the Great 8 rounds in Denver. The Lions leapt to an 11-0 lead on the strength of three-pointers by Stephanie Schultz and Haley Shaklee and inside buckets plus transitional points by Kate Webster. 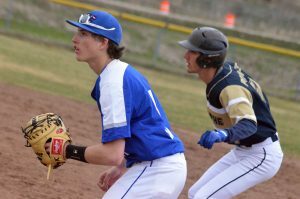 “We certainly knew Moffat County would make their run, but that was the kind of start we needed, for sure,” Lutheran coach Mark Duitsman said. A layup by Jaci McDiffett five minutes into the action got Bulldogs on the board, and shortly after coach Kenley Nebeker called a timeout to strategize. 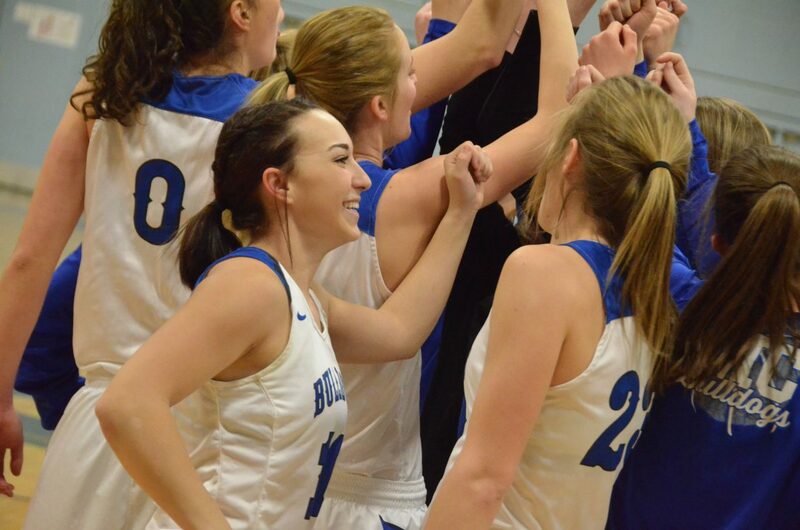 The breather helped, as Jana Camilletti traded triples with Shaklee, while Camilletti and teammate Brooke Gumber elbowed their way beneath the basket to get the score to a more manageable 14-9 by the end of the first quarter. Kinlie Brennise, Gumber and Tiffany Hildebrandt strung together five points to start the second and tie it up at 14 before Shaklee answered back with another outside make. Camilletti and Gumber each added one swish from the foul line, sandwiching a crucial block by Gumber, leaving the floor behind 17-16 at half. 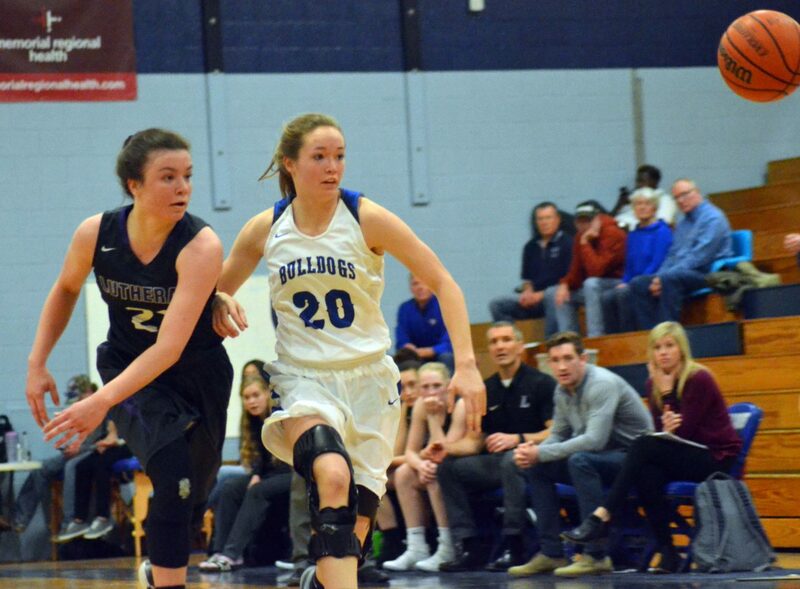 McDiffett gave the Dogs their first lead of the second with another shot from the post, and a pair of free throws by Camilletti made it 20-17. Isabel Dycus and Webster added a mid-range jumper and a three to retake the lead, which Camilletti mimicked with five points of her own, Duitsman calling a timeout with 4:30 left in the third period with Lutheran trailing 25-22. The Lion shooting game started to weaken from there as Moffat County upped its efforts on both ends of the court. Brennise capped off the quarter with a buzzer-beating tre banked off the backboard to make it a 30-23 Bulldog advantage. 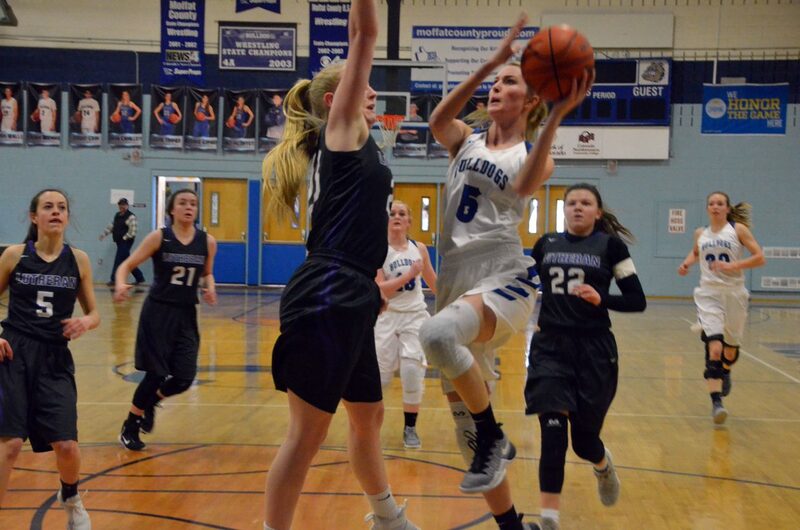 Still, Lutheran wasn’t going down without a fight in what would be their final eight minutes of the season, and Shaklee’s perimeter proficiency was suddenly back in full force with back-to-back triples to tie it at 32. A free throw by Hildy saw a three-point response from Schultz to regain the lead for Lutheran at 35-33. Gumber dropped in another field goal to even it up again, but her block attempt on Lexi Wilmoth resulted in a foul that let Lions edge forward with another point, with Webster hitting a jumper for the 38-35 lead. Lady Bulldogs had less than two minutes to make something happen as Nebeker called a timeout with 1:50 on the clock, and Camilletti promptly got the home crowd on its feet with a successful shot from the arc to make it 38-all. 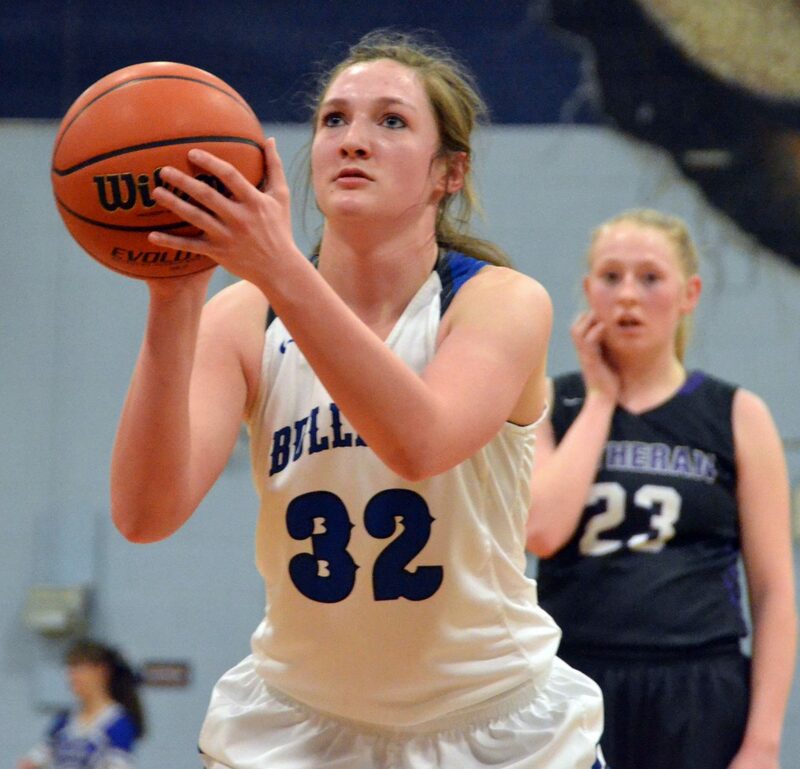 If that weren’t enough, Moffat County spectators were ecstatic with the next sequence as Webster bobbled the ball at half-court on her return back to the Lutheran end, accidentally kicking it out of bounds. After the inbound, Gumber and Hildebrandt got in position beneath the rim, and Hildy had little room to breathe with a frantic Lion defense, resulting in a trip to the stripe for what would be the go-ahead point. 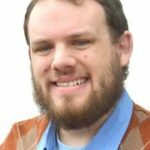 “I just took a deep breath and tried to shoot it like it was practice,” Hildy said. 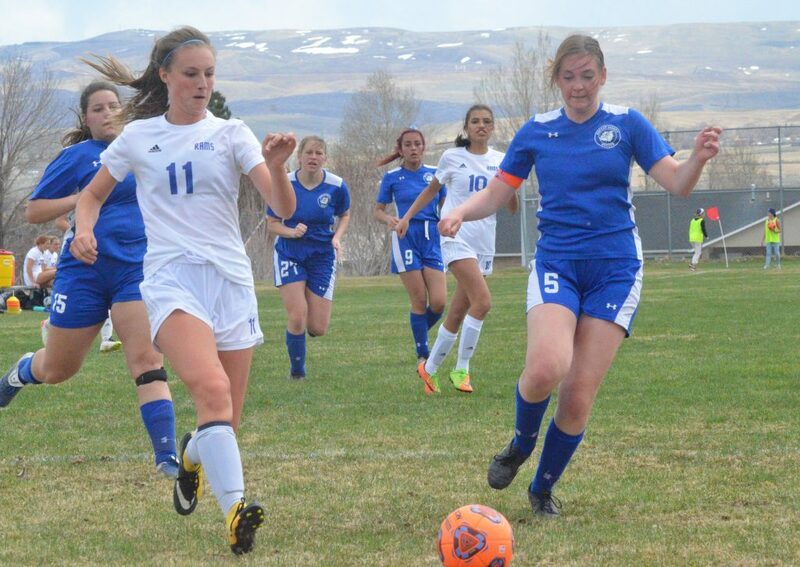 Kate Murphy had one more chance to tie it for Lutheran, though her attempt bounced off the iron, and the Lions’ strategy of swarming Camilletti as soon as she had the ball was what did them in as the Moffat County senior went five for six in three more setups. “It’s a lot of pressure, but it’s just a free throw like any other,” she said. Nebeker was somewhat puzzled by the slow start but more than satisfied with the outcome. Camilletti noted that beyond some minor anxiety in the opening minutes, Bulldog confidence was where it needed to be. “We really got our nerves out and after that it was us playing our game, not theirs,” she said. Camilletti had the best day of her career in terms of points, leading the day with 23 — three 3’s, two 2’s and 10 for 13 in free throws. Gumber had eight, Brennise five and McDiffett and Hildy four each. While Madie Weber, Jaidyn Steele and Quinn Pinnt didn’t add any points, their defensive effort limited the Lions greatly. “We’re playing great teamwork now, and we’re peaking right when we want to,” Pinnt said. Shaklee had 17 for Lutheran, including five from outside. Webster scored 10, Schultz six, Dycus three and Wilmoth two. The MCHS student section poured onto the court to congratulate their victorious athletes who were more than a little happy themselves. Still, even with the excitement of group photos, the tradition of cutting down the nets and other celebrations, Gumber noted the team’s credo going forth. 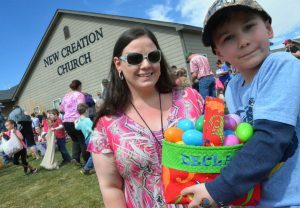 “We’ve just got to keep pushing — be happy but not be satisfied,” she said. 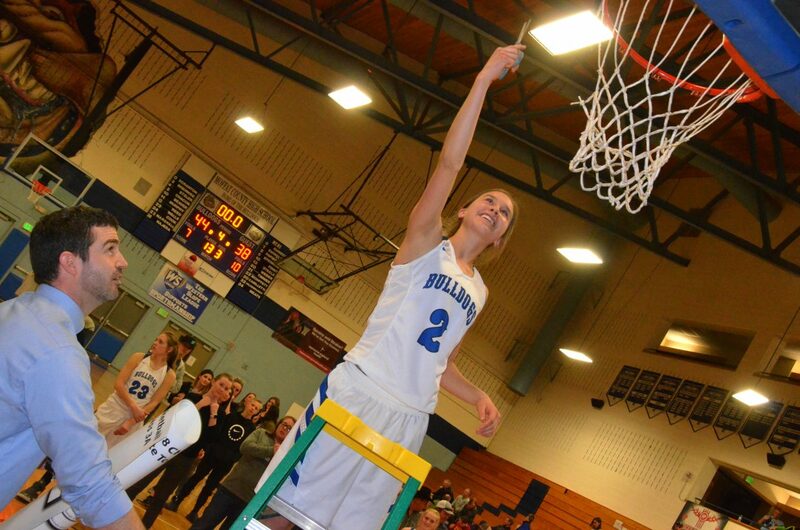 Now 19-5, Lady Bulldogs head into the CHSAA Great 8 round, starting Thursday at University of Denver. As they take on the best 3A teams from around the state, their No. 8 seed places them in a precarious position, meeting the top-ranked squad to start their last stretch. 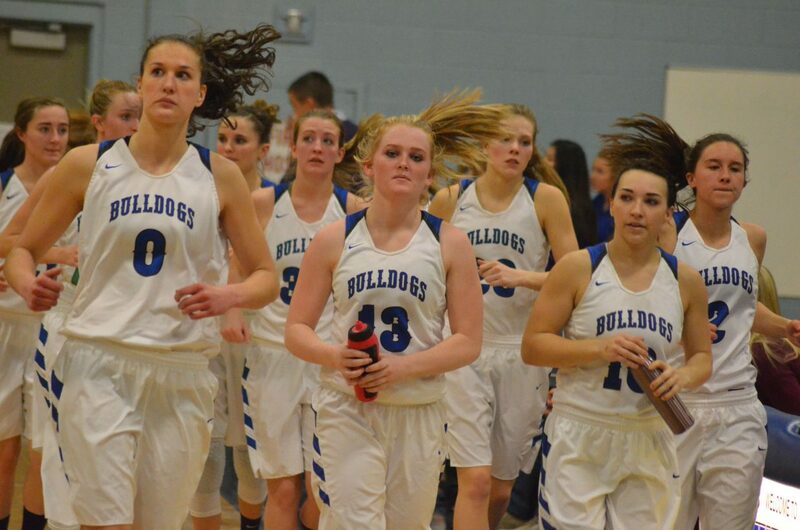 Though this might make other teams anxious, the Lady Dogs have a measuring stick that gives them confidence. No. 1 seed Kent Denver will be their next opponent, with the Sun Devils taking a 57-52 win Saturday against 3A Western Slope League team Delta, ranked 17th in the postseason. Though they took a loss to the Panthers in the regular season, MCHS beat Delta handily in the district tournament, and the common opponents don’t end there. 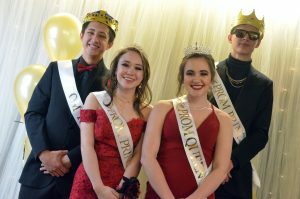 Besides a 56-45 win against Bishop Machebeuf during Metro’s district tourney — MCHS defeated the Buffaloes 48-32 in Friday’s Round of 32 — Lutheran topped 21-3 Kent 51-47 in early February to go undefeated in the Metro League during the regular season. Still, the Sun Devils had the last laugh against the Lions, 52-44, for the district championship that helped them get their top-tier status. 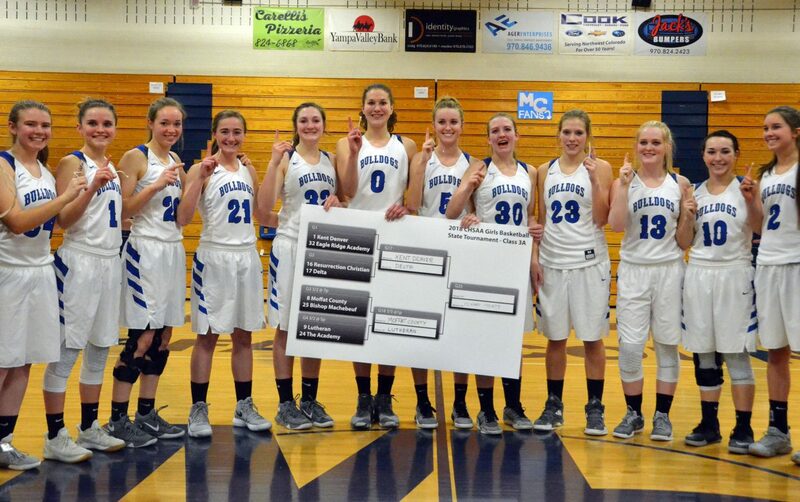 A matchup between 4 and 5 seeds Colorado Springs Christian (21-3) and Centauri (21-2) will determine who the winner of the MoCo/Kent game will see in the Final 4, but for now, MCHS girls are firmly focused on the Great 8. Numbers mean little at this point, and Lady Bulldogs almost prefer being considered the underdogs. “I think I’d rather be the team that beats the No. 1 team,” Camilletti said with a grin.